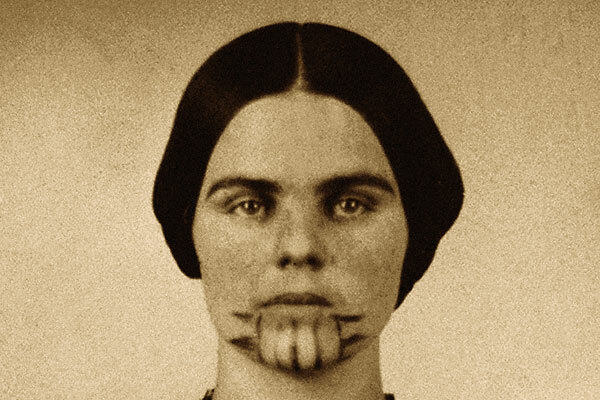 Olive Oatman (left), and her seven-year-old sister Mary Ann, were captured by Southwest Indians in 1851. The tattoo on her face was controversial for several reasons. There's nothing controversial about tattoos in American society today. It wasn't always that way however. There was a time when only sailors, carny freaks and criminals sported body art in America. There's something about self-branding that's appealed to mankind since ancient times. Interestingly enough, in ancient Egypt the majority of tattoos have been found on women, indicating status. Nothing new under the sun right? Women in America today are more likely to get a tattoo than men. The Egyptians also used tattoos for healing, religion, and a form of punishment. Moving on, the word tattoo is believed to have originated from the Samoan word tatau. The men's tattoo is called the pe'a, and the womens is called the malu. Facial tattoos are common with the Atayal tribe in Taiwan. They are proof a man can protect his homeland and that women are qualified to weave cloths and perform religious ceremonies. There was a period of time when sailors in the late 1800s to the early 1900s, got tattoos to identify their bodies should they be lost at sea or impressed by the British navy. If you were wondering who the first documented professional tattoo artist in the USA was...wonder no more; his name was Martin Hildebrant, a German immigrant who arrived in Boston, Massachusetts in 1846. Hildebrant tattooed soldiers (1861 to 1865) from both sides of the Civil War. The history of tattooing is interwoven in Eastern and Western cultures. Tattoos will always have a certain place in societies. We can thank the ancients for showing the way to the popularity of tattoos today. Tattoo to you, and may your ink always look new!